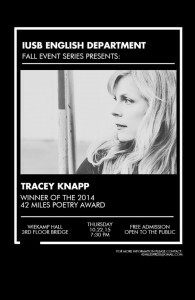 Tracey Knapp Reading at IU South Bend Tomorrow! Hi everyone! Just in case you haven’t heard, poet Tracey Knapp will be reading at IU South Bend tomorrow night at 7:30pm on the Bridge on the third floor of Weikamp Hall. She will be reading from her first full-length collection, Mouth, published by 42 Miles Press, and there will be books for sale and cookies after the reading! This is FREE and open to the public! And if you haven’t yet read Tracey’s book, there’s still time! You can purchase it here, or read some poems here, or read my review here. Also, if you are available this evening, Tracey will be visiting David Dodd Lee’s poetry workshop for a discussion and Q & A. This is also free and open to the public, so please come and join in on the conversation! This will be in Weikamp Hall on the second floor, room 2170. Tracey Knapp Q & A!